Yes, I'm still knitting. Cheating on my sewing… Should I feel bad about that? First and most importantly, the normal knitting action, which I showed you in the previous post, results in flat knit work. The kind for which you would need to knit one row and purl the next when knitting by hand. Which is really convenient because that's the stitch you need most often. What's less convenient is that alteration between knitting and purling isn't really possible on a single bed machine (yes, there should be a trick which somehow involves turn stitches, but I don't quite understand that yet). So, you can't make a regular rib or any of the many effect stitches using knit/purl variation. My manual shows a kind of mock-rib which I want to try, but haven't tried yet. What is odd though, is the fact that my 1957 Libelle magazines include the occasional pattern designed especially for knitting machines and those often have ribbed bands. Could those simple machines back then do something mine can't? Was there a trick everyone knew so they didn't need to explain it? Or were you supposed to knit those bits by hand? I just don't know. Another issue is gauge. You can't just knit any thickness of yarn with any knitting machine. And the terms used for the size of the yarn is different too. My manual just speaks of one, two and three strands in the yarn… Apparently it means I can knit with yarn for normal needle sizes (European ones) 1 to 5. Or 2 to 7, depending on your source. I tried super thin yarn and it works, but the resulting fabric is so thin it's transparent. I haven't dared to try my thickest yarn yet (which should be for about a 7 needle) because I'm afraid it might damage the needles. Anyway, there are knitting machines especially for bulkier yarns. And I'm sure there may also be some with their needles closer together so you can knit that superfine yarn into something non-transparant. Which really would be like making your own jersey fabric. I'm happy with the gauge on my machine. As I've mentioned before, garments from bulky yarn may look nice but for me, they're just to warm for regular wear. And about yarn, you really have to use yarn on cones for a knitting machine. You can get a wool winder and put yarn from balls on cones but you have to use cones when knitting. Because you knit a row at a time, the yarn has to be pulled up quite quickly. With a cone, which is just a giant spool, that's no problem. A ball of wool would get all tangled up. And then we come to tho issue of patterns. Patterns especially for knitting machines are few and far between. 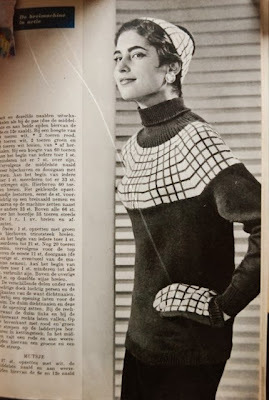 I googled for them, both in Dutch and in English, and in both cases I was taken to Ebay listings for knitting machines and to normal knitting patterns on the first page. Of course, you can use some normal knitting patterns. I made my cardigan using one of those. But then, you have to deal with the knit/purl issue. And the fact that it's kind of impossible to measure your work while it's one the machine. And occasionally, you'll have to re-think to order of construction (like whether to knit from the top down or from the bottom up). Oh, and a lot of modern knitting patterns are for (fairly) bulky yarns, so they may be no good on a regular knitting machine. Luckily, I like vintage patterns. Considering the pattern-situation, I was really surprised to find that, in 1957, Libelle printed a pattern for knitting machines in each issue (and this was a weekly magazine…). Knitting machines must have been really popular back then. I have most of the issues from that year and there are a few project I like. Right now, I'm working on this one, but with a difference. You see, I like the sort of semi-fitted shape with the round yoke. 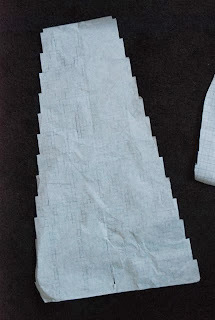 They cleverly constructed the yoke from 10 separate pieces, negating both the need for more needles than there are on most machines and the tedious task of endlessly having to decrease stitches in the middle of your work. In fact, I thought this might be a good opportunity to try out some of my machine's special effect stitches. It will do several of those. That's what the buttons and handle are for. And switch to "MC" and introduce a second strand of yarn and you can do fair isle! 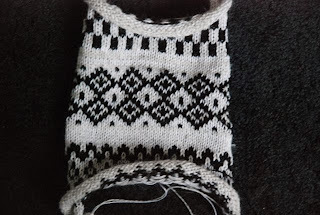 After these successful swatches, I decided to make a fair isle yoke. And with those small pieces, I'd limit the risk of messing it all up at the last moment. 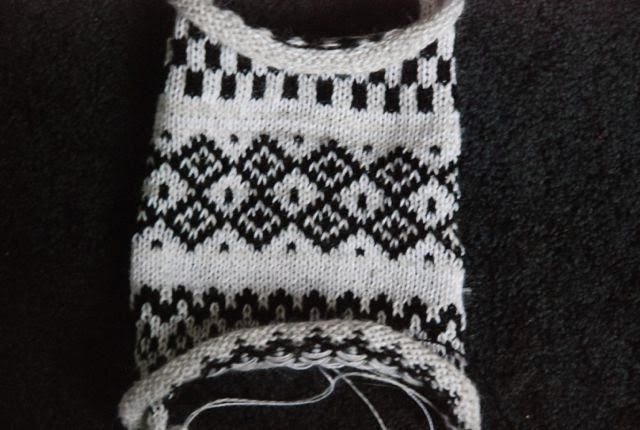 You know, by dropping a stitch in the second-to-last row, or something like that (you can pick up dropped stitches, but if they unravel far down, it gets difficult and in fair isle it's really hard because the extra hreads at the back make things really confusing). I knew how many stitches and how many rows went into those yoke pieces, so I cut those on paper. I also knew that my machine has eight buttons which means it can only control the needles in sets of eight. 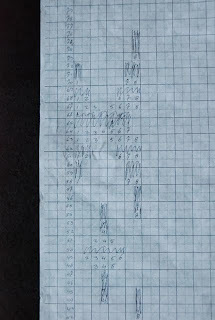 When I was happy with the design, I drew out a chart, to tell my self when to press which buttons. The good news is, it works. The bad news is it takes a lot of attention and effort. Forget to change one setting and you have to unravel a row, lose tension on one thread and stitches fall off. Drop a stitch and you can't put it back on because you can't see whether loose threads at the back are just that, or belong to the stitch. 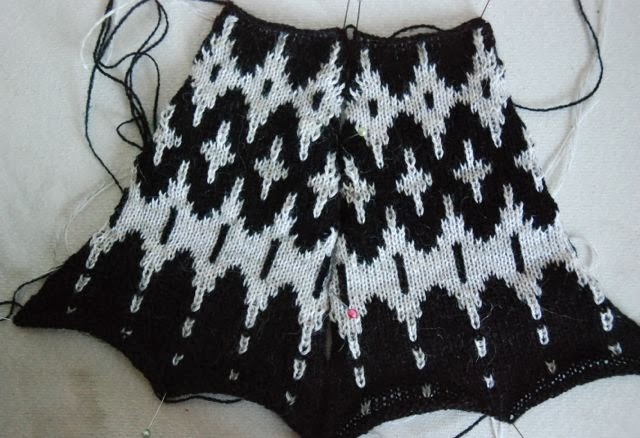 In flat knitting, I could have an entire back or sleeve done in two hours. These things take that long each. If they work out at all. And they never do in the evening. Even if I think I'm not tired, apparently I'm too tired for fair isle knitting my own design. 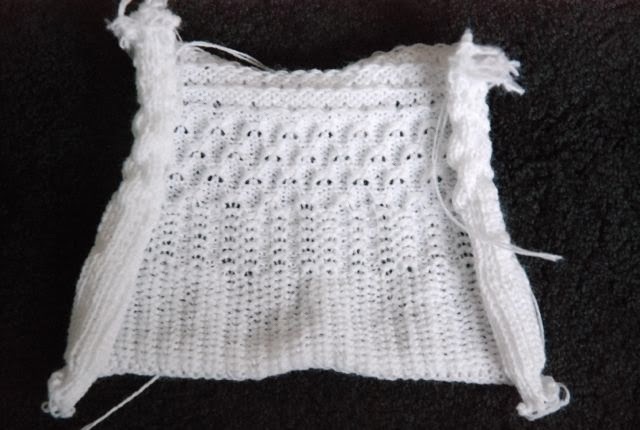 I have a manual knitting frame and use it mainly for miles of stockinette. I never mastered the technique of dropping stitches and then knitting them back up in the other direction to make ribs. I find it easier just to knit the rib by hand, then place the stitches on the knitting bed needles for the stockinette portions. Knitwear designer, Bonne Marie Burns, does that frequently. To save time and wear and tear on her wrists, she knits the plain stockinette parts on a knitting machine and the complicated parts by hand. 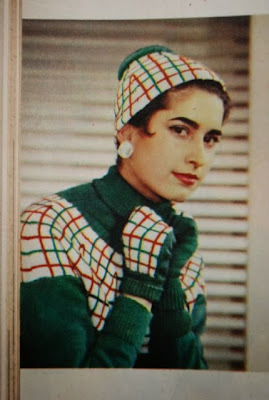 Olga Jazzy, another knitwear designer, does the same. You may well be able to buy a matching ribber machine for your knitting machine. I have a ribber for my knitting machine (luckily the person I bought from had the set). It is attached to the table below the knitting machine and the stitches for one garment are divided between the 2 machines. It probably takes a bit of research to find the right ribber, but eBay sellers do sell them separately sometimes. You need something that looks like a giant comb to turn your work, I think (I haven't done this). How great to have a knitting machine! I looked into them a few years ago because I thought it would save time and effort for plain stockinette projects or pieces. I may need to revisit this. Your patterned piece turned out lovely! These samples are very cool! You are smart to be able to figure all this out. I love the fair isle and the pointelle swatches that you made! I admire your skills to be able to master such a machine! Can't wait to see the finished piece. You'll get there in the end! Beautiful fair isle design! Did you know that Phildar does machine knitting instructions for their models? At least I have noticed that in their kids catalogues. Happy knitting, looking forward to more of your adventures in this! Omg, I'm also a sewing person following in silence all the blogs. 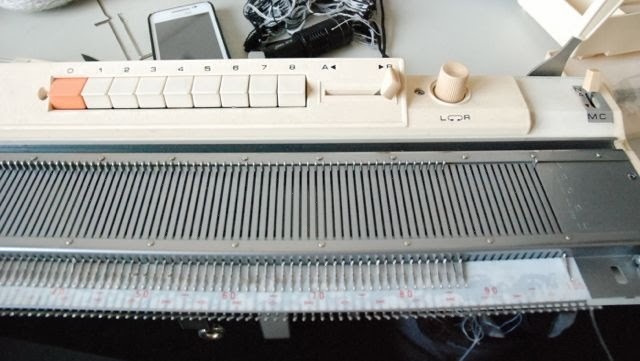 But recently I've bought a knitting machine and no one around here is having one (I'm from Romania). I am so glad to see someone like me is sharing their adventures from sewing to machine knitting. By the way, manuals aren't so great when it comes to instructions. But youtube videos are fantastic. Roberta Kelley, Diana Sullivan channels are full of useful stuff, especially with techniques for beginners. Waiting for more of your posts about your machine knitted projects, Ana.